Tournament Information: Sections, schedules, entry fees, prize funds, hotel info, etc. ♘ Connecticut Chess Magazine by Rob Roy blog. ♝ Billerica Chess Club weekly results are now available on this site as part of the Other Organizations section. I've recorded, edited, and uploaded Wednesday night's game vs Don Ostrowski (1627), in a Scotch Opening. Note: Projected pairings & colors are only estimates. Official pairings are posted at the beginning of each round. Ed Harris, Jim Donahue, Dave Thomas, Mike Meehan, Tom Fratturelli, Mike Stevens and Keith Hamer. ♖ Not playing round 1 were Bryce McLaughlin and Dillon Motyka. ♙ The Wachusett Chess Club welcomes Jhojan Segura. 2019 WCC 'A' Club Championship Tournament. The Top Four Highest GPP Finishers Qualify. The remaining four to qualify will be the four with highest percentage as calculated in the last column. after the final regular season tournament is rated! A minimum of 22 games must be completed to qualify. Andrew Jeselson, a Wachusett Chess Club member from Leominster and a student at Fitchburg State University, posted a perfect score of 4-0 to claim first place in the students section of the Worcester State University Intercollegiate Tournament, held on Saturday, April 13, in Sheehan Hall at the university. Capturing 2nd place on tiebreak with a 3-1 tally was Christian Scillitoe of Worcester Polytechnic Institute, while Dermot McCormick of Worcester State University was awarded 3rd place on tiebreak with the same score. Jeselson defeated both Scillitoe and McCormick. The tournament, which had a total of 37 players - 13 in the students section and 24 in the non-students (Open) section, was hosted by Bill Shakalis and Alvin Marchena of Worcester State University. Joe Alfano of Assumption College was the tournament director. The tournament had two sections: Students section and Non-students/Open section. 1.. Strength of opponents: Christian's opponents had the highest total score, Patrick's had lowest. 2.. Then a 5-minute blitz game between Dermot and Kha Li; Dermot won that game. A 5-minute blitz game between Achu and Bhon; Achu won that game. Strength of opponents: Juan Luis's opponents had the highest total score. In each round, the player is listed with their opponent and final score. E.g. in Round 1, Andrew Jeselson played Ryan Doyle (player 10) and won. e.g. if I recorded your school/club incorrectly. Michael David, a Wachusett Chess Club member from Groton, scored an undefeated result of 3-1 to tie for first place in the Under 1600 section of the Westford April Open , held April 13-14 at the Westford Regency Inn & Conference Center. The director of the Billiards Cafe Chess Club in Ayer shared top honors with fellow Bay State players Robert Kauffman, Prachi Dayal and Meghana Kunamneni. David defeated Dayal and drew Kauffman and Kunamneni. Winning the Championship section with a score of 3.5-0.5 was 30-year-old GM Jianchao Zhou of China. [Close behind with scores of 3.0-1.0, a trio of Massachusetts residents including GM Fidel Corrales Jimenez (winner of the 2018 USChess Grand Prix), GM Alexander Ivanov, & NM Karthik Padmanadhan finished in a tie for second place overall.] The four-section tournament drew a total of 53 players. This week my game was with Mike Meehan, who played the White side of a Stonewall Attack against me. I've also included a bit of information about the EHT black hole image result, in which I was involved. Hope you enjoy them. David Martin, Stephen Murray, Dave Thomas and Raaga Pulya. Pictures from this year's Gail S. Lingner Memorial tournament. Ritvik Pulya, Stephen Murray, Jim Hankard, Dave Thomas, Larry O'Rourke, Roland Booker and Raaga Pulya. ♙ The Wachusett Chess Club welcomes new USCF member Tyler Bedard, a student at Leominster High School. ♝ The club welcomes back David W. Martin, whose last appearance at the club was in June 2017, when he played in the "B" Division of the Wachusett Chess Club Championship. REMINDER: Players must be present in Room C159 by by 7:10 P.M. in order to be paired for Round 5 on April 10th. Players running late who wish to be paired MUST CALL by 7 P.M.
Andrew Jeselson, a Wachusett Chess Club member from Leominster and a student at Fitchburg State University, scored 3.5-0.5 to capture first place in the 13-player Under 2100 section of the Modern Chess Conceptions Classic, held Sunday, March 31, at the Westford Regency Inn & Conference Center in Westford. The Class A player, who hails from Rome, New York and started playing rated chess in late August 2015, gained 86 rating points and boosted his rating to 1922. 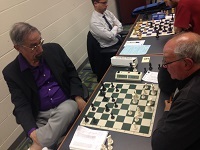 Winning the 11-player Championship section with a score of 4-0 was 62-year-old GM Alexander Ivanov of Newton, a 14-time Massachusetts state champion. Grandmaster Hikaru Nakmura, the 1th-ranked player in the world, won the 2019 U.S. Championship on Sunday, March 31, at the St. Louis Chess Club. The 31-year-old GM won his 5th national title by defeating GM Jeffery Xiong in the 11th and final round, finishing with a score of 8-3. Nakamura's previous U.S. Championship victories came in 2005, 2009, 2012 and 2016. Tying for 2nd-3rd with 7.5 points each were GM Fabiano Caruana, the No. 2 player in the world and 2016 U.S. champion, and GM Leinier Dominguez, a 5-time Cuban national champion who was making his debut in a U.S. Championship. Caruana drew with 2018 U.S. champion Sam Shankland, while Dominguez was held to a draw by GM Timur Gareyev. Tying for 4th-5th place with 6 points apiece were 2017 U.S. champion Wesley So and Massachusetts' GM Sam Sevian. Shankland ended in clear 6th place with 5.5 points. Xiong and GM Awonder Liang, who beat So, tied for 7th-8th place with 5 points each. Deadlocked in 10-12th place with 4 points apiece were GM Aleksandr Lenderman, who drew Sevian, GM Varuzhan Akobian, who defeated GM Ray Robson, and GM Gareyev. Robson finished 12th and last with 3.5 points. Jennifer Yu clinched this year's U.S. Women's Championship in Round 10 on Saturday. She ended the tournament with a win against Massachusetts' Carissa Yip in Round 11 and finished with a phenomenal score of 10-1. Tied for 2nd-3rd place with 7.5 points each were 3-time U.S. women's champion Anna Zatonskih and Tatev Abrahamyan. In 4th place with 7 points was Annie Wang. Tied for 5th-7th place with 5 points apiece were 7-time U.S.women's champion Irina Krush, Anna Sharevich and Ashritha Eswaran. Ending up in 8th place with 4.5 points was Carissa Yip. Deadlocked in 9th-11th place with 4 points each were Maggie Feng, Sabina Foisor and Akshita Gorti. Taking 12th and last place was Emily Nguyen. Results of Round 11 games were as follows: Foisor 1-0 Zatonskih, Gorti 1/2-1/2 Abrahamyan, Wang 1/2-1/2 Sharevich, Krush 1-0 Feng, and Nguyen 0-1 Eswaran. The 11th and final round of the U.S. Championship will be packed with tension on Sunday, March 31, when GMs Hikaru Nakamura, Leinier Dominguez and Fabiano Caruana square off in an attempt to win to become this year's U.S. champion. All three are deadlocked in first place with scores of 7-3. In Round 10, played on Saturday, March 30, Nakamura drew Dominguez, while Caruana defeated Aleksandr Lenderman to become one of the three leaders. A full point behind the leaders is Wesley So, who drew Massachusetts' Sam Sevian. who stands at 5.5-4.5. Results of other Round 10 games were as follows: Awonder Liang 1/2-1/2 Jeffery Xiong, Varuzhan Akobian 1/2-12 Sam Shankland, Timur Gareyev 1-0 Ray Robson. The three critical Round 11 games are as follows: Xiong vs. Nakamura, Dominguez vs. Gareyev, and Shankland vs. Caruana. Jennifer Yu clinched 1st place in the Women's Championship on Saturday, defeating rival Anna Zatonskih in Round 10. Jennifer stands at a phenomenal 9-1 with one round to play. Despite the loss, Zatonskih remains in 2nd place with 7.5 points. A half point behind Zatonskih is Tatev Abrahamyan, who beat Sabina Foisor. Annie Wang is in 4th place with 6.5 points after beating Massachusetts' Carissa Yip, who is tied for 5th-6th place with Anna Sharevich, both of whom have 4.5 points. Sharevich downed Emily Nguyen. Results of other games were as follows: Maggie Feng 0-1 Akshita Gorti, Ashritha Eswaran 1/2-1/2 Irina Krush. U.S. Championship leaders Hikaru Nakamura and Leinier Dominguez are set for a big battle on Saturday, March 30, when they face each other at the Saint Louis Chess Club in Round 10, after scoring wins in Round 9 on Friday to maintain their joint lead in the 12-player round robin with 6.5 points apiece. Nakamura beat Ray Robson, while Dominguez defeated Awonder Liang. Just a half point behind them is Fabiano Caruana, who downed Varuzhan Akobian. Wesley So is in 4th place with 5.5 points following his win against Aleksandr Lenderman. Massachusetts' Sam Sevian holds onto 5th place with a 5-4 score after drawing Jeffery Xiong. In the only other decisive game, defending U.S. champion Sam Shankland beat Timur Gareyev. The Women's Championship will also see a big game in Round 10 on Saturday, when tournament leader Jennifer Yu, who stands with an 8-1 score, faces Anna Zatonskih, who is in second place with 7.5 points. In Round 9, Yu drew with Tatev Abrahamyan, who is in 3rd place with 6 points, while Zatonskih defeated Annie Wang, who is in 4th place with 5.5 points. Massachusetts' Carissa Yip maintains 5th place in the standings with 4.5 points after defeating Emily Nguyen. Results of other games were as follows: Ashritha Eswaran 0-1 Maggie Feng, Irina Krush 1/2-1/2 Anna Sharevich, Sabina Foisor 1-0 Akshita Gorti. 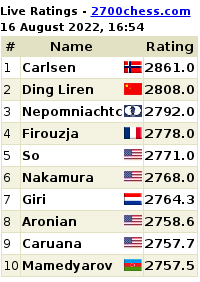 After 8 rounds of play in the U.S. Championship at the Saint Louis Chess Club, Leinier Dominquez is now tied for the lead with 4-time U.S. champion Hikaru Nakamura. The 35-year-old, 5-time Cuban national champion, who changed federations in December 2018, defeated Massachusetts' top player, 18-year-old Sam Sevian, on Thursday, March 28. The win gave Dominguez a total of 5.5 points and put him even with Nakamura, who drew defending U.S. champion Sam Shankland. Just a half-point behind Nakamura and Dominguez is 2016 U.S. champion Fabiano Caruana, who drew with 2017 U.S. champion Wesley So. Standing at 5.5. point each are So and Sevian. Results of other games were as follows: Aleksandr Lenderman 1/2-1/2 Jeffery Xiong, Awonder Liang 1/2-1/2 Ray Robson, Timur Gareyev 1/2-1/2 Varuzhan Akobian. Jennifer Yu continues to hold her lead in the Women's Championship with a terrific score of 7.5-0.5, defeating Akshita Gorti in Round 8. 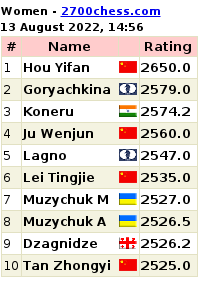 Anna Zatonskih still remains in second place, with 6.5 points, after drawing Emily Nguyen. Tied for 3rd-4th place with 5.5 points apiece are Annie Wang and Tatev Abrahamyan, who drew each other in the round. Massachusetts' Carissa Yip, who lost to 7-time U.S. Women's champion Irina Krush, is tied for 5th-6th place with Ashritha Eswaran, who drew Anna Sharevich. Both have 3.5 points. In the only other decisive game, Maggie Feng beat 2017 U.S. women's champion Sabina Foisor. 2 major upsets (♔ ♕), one upset draw (♖). ♝ Receiving a half-point bye was Roger Cappallo. ♖ Not playing round 3 was Dillon Motyka. ♟ Withdrawn from the tournament was Bob Mathieu. ♗ Requesting a half-point bye for Round 4 is Cappallo. ♙ The Wachusett Chess Club welcomes Keith Hamer of Hollis, NH, who renewed his USCF membership after an absence of about 30 years from over-the-board play. Welcome, Keith!. REMINDER: Players must be present in Room C159 by by 7:10 P.M. in order to be paired for Round 4 on April 3rd. This Sunday, March 31, from 2 to 5 p.m. in the Stone House at Coggshall Park in Fitchburg. Entrance to the park is off Electric Avenue on the road right before the Knights of Columbus Hall. Directions will be sent to all players who plan to attend - with or without an accompanying spouse or friend. Four-time U.S. champion Hikaru Nakamura has taken over the lead in this year's U.S. Championship, after he defeated fellow GM Timur Gareyev in the 6th round on Monday, March 25, at the St. Louis Chess Club. Nakamura now stands at 4-2 in the 12-player field. Tied for the runner-up spot with 3.5 points are Massachusetts' Sam Sevian, who drew defending U.S. champion Sam Shankland, 2016 champion Fabiano Caruana, who drew former tournament leader Jeffery Xu, 2017 champion Wesley So, who beat Leinier Dominguez, and Dominquez himself, who is making his debut in a U.S. Championship. Results of other games were as follows: Awonder Liang 1-0 Varuzhan Akobian, Aleksandr Lenderman 1/2-1/2 Ray Robson. Jennifer Yu holds onto the lead in the Women's Championship with a score of 5.5-0.5 after defeating Maggie Feng in Round 6. Four-time Women's champion Anna Zatonskih is in 2nd place with a 5-1 tally following her win against Ashritha Eswaran. Tatev Abrahamyan has taken over 3rd place with a 4.5-1.5 record after she bested 7-time Women's champion Irina Krush. Annie Wang downed Sabina Foisor to move into 4th place with a 4-2 score. And Massachusetts' own Carissa Yip is now in 5th place after she drew Anna Sharevich. In the only other decisive game, Akshita Gorti beat Emily Nguyen. The players will take a rest on Tuesday, March 26, only to resume play for Round 7 on Wednesday, March 27. The 11th and final round will be played on Sunday, March 31. Round 5 on Sunday, March 24, in the U.S. Championship at the St. Louis Chess Club produced two decisive games in the Open division, where 18-year-old Sam Sevian of Holden, Mass. defeated Varuzhan Akobian and Timur Gareyev beat Awonder Liang. Sevian's win now puts him in a 5-way tie for first place at 3-2 with Wesley So, Hikaru Nakamura, Leinier Dominguez and Jeffery Xiong. The games Ray Robson-So, Nakamura-Fabiano Caruana, Dominguexz-Xiong and Sam Shankland-Aleksandr Lenderman ended in draws. Jennifer Yu, the 17-year-old Woman Grandmaster, still remains in first place in the Women's Championship with a score of 4.5-0.5 after drawing WIM Annie Wang in Round 5. In current possession of 2nd place with a 4-1 record is IM Anna Zatonskih, who drew WGM Anna Sharevich. WGM Tatev Abrahamyan is in 3rd place with 3.5 points after defeating WIM Ashritha Eswaran for her third win in a row. In the only other decisive game, 15-year-old WIM Carissa Yip of Andover, Mass. beat WIM Maggie Feng to move into a tie for 4th place with Wang. Drawn were the games Irina Krush-Akshita Gorti and Emily Nguyen-Sabina Foisor. Jennifer Yu, the 17-year-old Woman Grandmaster from Ashburn, Virginia, chalked up her fourth win in a row on Saturday, March 23, defeating WIM Emily Nguyen in the U.S. Women's Championship at the Saint Louis Chess Club. Four other games also ended decisively as follows: Anna Zatonskih 1-0 Carissa Yip, Tatev Abrahamyan 1-0 Anna Sharevich, Sabina Foisor 1-0 Irina Krush and Akshita Gorti 1-0 Ashritha Eswaran. The game Maggie Feng vs. Annie Wang was drawn. Currently in 2nd place with a score of 3.5-0.5 is Zatonskih, while Abrahamyan and Wang are tied for 3rd with tallies of 2.5-1.5. In the all-Grandmaster main event, Jeffery Xiong lost to Ray Robson to fall into a 4-way for first place with 2.5 points out of 4 with Wesley So, who drew Sam Shankland, Hikaru Nakamura, who drew Awonder Liang, and Leinier Dominguez, who drew Fabiano Caruana. Results of other Round 4 games were as follows: Sam Sevian 1/2-1/2 Timur Gareyev, Aleksandr Lenderman 1/2-1/2 Varuzhan Akobian. Round 3 of the U.S. Championships on Friday, March 22, at the St. Louis Chess Club produced new tournament leaders in both divisions of play. Jeffery Xiong scored a major win in the main event by defeating defending U.S. champion Sam Shankland. The win now puts Xiong in the lead with a score of 2.5-0.5. Tied for the runner-up spot are Hikaru Nakamura, who beat Massachusetts' Sam Sevian; Wesley So, who drew Varuzhan Akobian; and Leinier Dominguez, who defeated Ray Robson. So, Nakamura and Dominguez have 2-1 tallies. Other Round 3 results were as follows: Awonder Liang 1/2-1/2 Fabiano Caruana, Timur Gareyev 1/2-1/2 Aleksandr Lenderman. WGM Jennifer Yu took over the lead in the Women's Championship, defeating former U.S. Women's champion GM Irina Krush for her third win in a row. IM Anna Zatonskih is now in 2nd place with a score of 2.5-0.5 after beating WIM Maggie Feng. Tied for 3rd place with 2-1 tallies are WIM Carissa Yip of Massachusetts, who lost to former U.S. Women's champion WGM Tatev Abrahamyan, and WIM Annie Wang, who drew WIM Emily Nguyen. Results of other games were as follows: WIM Ashritha Eswaran 1-0 WGM Sabina Foisor, WGM Anna Sharevich 0-1 WIM Akshita Gorti. Here is a link for my video on last night's game against Larry O'Rourke, in which he assayed the Slav Defense. The astronomy segment addresses the question, "Which planet, on average, is closest to the Earth?" Carissa Yip, the youngest participant in this year's U.S. Women's Championship, won again in the 12-player round-robin event by defeating 16-year-old WIM Akshita Gorti in Round 2 on Thursday, March 21, at the Saint Louis Chess Club. The win puts the 15-year-old WIM from Andover, Mass. in a tie for the lead with 17-year-old WGM Jennifer Yu, who beat WIM Ashritha Eswaran. Both Carissa and Jennifer have 2 points and currently lead the field. Results of the other Round 2 games in the Women's Championship were as follows: WIM Annie Wang 1/2-1/2 GM Irina Krush, WGM Tatev Abrahamyan 1/2-1/2 IM Anna Zatonskih, WGM Sabina Foisor 1/2-1/2 WGM Anna Sharevich, WIM Maggie Feng 1/2-1/2 WIM Emily Nguyen. Massachusetts' other participant in the U.S. Championship, 18-year-old GM Sam Sevian of Holden scored a win in the main event's 2nd round over GM Awonder Liang to now share the lead with 1.5 points with GMs Jeffery Xiong and Wesley So. Xiong drew with GM Varuzhan Akobian, while So defeated GM Timur Gareev. Results of the other games were as follows: GM Fabiano Caruana 1/2-1/2 GM Ray Robson, GM Aleksandr Lenderman 1/2-1/2 GM Hikaru Nakamura, GM Leinier Dominguez 1/2-1/2 GM Sam Shankland. The two Massachusetts players competing in this year's U.S. Championships got off to a good start on Wednesday, March 20th, in Round 1 of the round-robin event being played at the Saint Louis Chess Club. Fifteen-year-old WIM Carissa Yip of Andover, 2014 Wachusett CC champion and 2016 Boylston CC champion, defeated WGM Sabina Foisor in the Women's Championship, while 18-year-old GM Sam Sevian of Holden held the top seed and the world's No. 2 player, Fabiano Caruana, to a draw in the main event. All the games in the women's division were decisive, with the following results in addition to Carissa's win with White over Foisor: GM Irina Krush 1-0 Emily Nuguyen, Anna Zatonskih 1-0 Akshita Gorti, WGM Tatev Abrahamyan 0-1 FM Maggie Feng, WIM Ashrita Eswaran 0-1 WIM Annie Wang, WGM Anna Sharevich 0-1 WIM Jennifer Yu. In the all-GM main event, the only decisive game was Jeffrey Xiong's win (with Black) over Timur Gareev. In addition to Sevian's draw with Caruana, results of the others games were as follows: Hikaru Nakamura 1/2-1/2 Wesley So, Sam Shankland (defending U.S. champion) 1/2-1/2 Ray Robson, Awonder Liang 1/2-1/2 Aleksandr Lenderman, Varuzhan Akobian 1/2-1/2 Leinier Dominguez. ♝ Receiving half-point byes were Mike Lally and Bob Mathieu. ♖ Not playing round 2 were Bryce McLaughlin and Dillon Motyka. ♗ Requesting a half-point bye for Round 3 is Cappallo. ♙ The Wachusett Chess Club welcomes back two Wachusett CC players: Dave Kochman, whose last appearance was on Feb. 3, 2016, when he won the Reggie Boone Memorial, 4.5-0.5; and Roland Booker, whose last appearance was on Sept. 26, 2018. REMINDER: Players must be present in Room C159 by by 7:10 P.M. in order to be paired for Round 3 on March 27th. This Sunday's Worcester Telegram & Gazette (March 17th 2019) contains a feature story by correspondent, Paula J. Owen, about WCC Program Director, George Mirijanian. Well, I finally bit the bullet and analyzed my lost to Steve Murray (1651), against whom I adopted a French Defense. As a bonus, I've included a short segment on "The Myth of Infrared". Hope you enjoy it. ♝ Receiving half-point byes were George Mirijanian, Mike Lally, Mike Commisso, Jim Donahue, Mike Meehan and Bob Mathieu. 0.0 Kildahl, Cappallo, Fratturelli, Ostrowski, Stevens, Briggs, David, Bastarache, O'Rourke, Wheeler, Biglow, Ra. Pulya, H.
REMINDER: Players must be present in Room C159 by by 7:10 P.M. in order to be paired for Round 2 on March 20th. The U.S. women's team lost to Russia on Monday, March 11th, in round 6 of the World Team Championship in Astana, Kazakhstan. Draws were gained by WGM Tatev Abrahamyan on board 1, WGM Katerina Nemcova on board 2, and WCM Rochelle Wu on board 4. Suffering the team's only loss was 15-year-old WIM Carissa Yip on board 3. Carissa, a former Wachusett CC and Boylston CC champion, lost to 20-year-old GM Aleksandra Goryachkina (FIDE rated 2504), a two-time Russian women's champion and a two-time World Girls Under-20 champion. The loss now puts the U.S. women's team in 7th place in a field of 10 teams, with three rounds yet to play. The following ratings are in effect for the Gail S. Lingner Memorial, which begins Wednesday, March 13, in Room C159 of the McKay Complex at Fitchburg State University. Registration is from 6:30 to 7 p.m., with Round 1 starting at 7:15 p.m. Deadline for all subsequent rounds is 7:10 p.m. Players running late who wish to be paired MUST CALL by 7 p.m. The U.S. women's team rebounded from its loss to Kazakhstan on Friday to defeat Armenia, 3-1, in Round 5 of the 2019 World Team Championship on Saturday, March 9, in Astana, Kazakhstan. Winning for the USA were WGM Tatev Abrahamyan on board 1, WGM Katerina Nemcova on board 2, and WIM Carissa Yip on board 3. WGM Sabina-Francesca Foisor suffered the team's only loss on board 4. Carissa's victory was against 17-year-old Woman FIDE Master Anna M. Sargsyan. I've published episode 58 of MWATC, my game last night in the 5th round of the George O'Rourke Memorial. I had the black pieces against Gary Brassard (1742) and we ended up in a London / Indian hybrid. The astronomy segment is 'The Color of Stars'. I hope you enjoy it. Kildahl wins with perfect 5-0... again! Dave Thomas, Bob Mathieu, Don Ostrowski, Joe Bennett and Bryce McLaughlin. Pictures from this year's George E. O'Rourke Memorial tournament. ♝ Receiving half-point byes were Michael Lally and Geoff LePoer. ♖ Not playing round 4 were Dave Thomas, Jim Hankard, Hugh McLaughlin and Dillon Motyka. ♟ Already withdrawn from the tournament are Joe Bennett and Bryce McLaughlin. ♙ The Wachusett Chess Club welcomes Class A player Andrew Jeselson of Rome, New York, who is studying for an MBA at Fitchburg State University. REMINDER: Players must be present in Room C159 by by 7:10 P.M. in order to be paired for Round 5 on March 6th. Michael Stevens, Jim Hankard and Raaga Pulya. ♙ Bryce McLaughlin and Vince Premus withdrew from the tournament. ♟ Joe Bennett had already withdrawn from the event. ♗ Requesting a half-point bye for Round 4 is is LePoer. ♝ Also not playing but declining a half-point bye is H. McLaughlin. REMINDER: Players must be present in Room C159 by by 7:10 P.M. in order to be paired for Round 4 on February 27th. This week I played Larry Gladding (1765) in a QGD. The opening line was somewhat similar to our game in episode #52, and Larry got a promising K-side attack out of it. ♝ Receiving half-point byes were Ritvik Pulya, Dave Thomas, Arthur Barlas, Vince Premus, Jim Hankard and Raaga Pulya. ♙ Joe Bennett withdrew from the tournament. ♗ Requesting a half-point bye for Round 3 is Stevens. REMINDER: Players must be present in Room C159 by by 7:10 P.M. in order to be paired for Round 3 on February 20th. After a bit more effort than I care to admit, I got my most recent analysis video posted. In it I play Don Ostrowski in the first round of the George O'Rourke Memorial. He played 1. e4 and I responded with a French Defense. My weekly game from the Wachusett Chess Club, where I played Black in a French Defense against Don Ostrowski (1571). Vince Premus and Tom Fratturelli. ♘ The Wachusett Chess Club welcomes back Bruce Felton, Joe Bennett, and Mike Lally, the last of whom has not played at the club since September 17, 2014. ♙ The club also welcomes new player Michael Stevens of Whitinsville, who is a regular player at the Greater Worcester Chess Club. REMINDER: Players must be present in Room C159 by by 7:10 P.M. in order to be paired for Round 2 on February 13th. The following ratings are in effect for the George E. O'Rourke Memorial, which begins Wednesday, Feb. 6, in Room C159 of the McKay Complex at Fitchburg State University. At 6:40 p.m. on Wednesday, Feb. 6, the latest episode of Chess Chat will be presented, showing the game between 18-year-old GM Sam Sevian (the No. 1 player in Massachusetts, who lives in Central Mass. in Holden) and soon-to-be 20-year-old IM Ravi Haria (British player) from the Pro Chess League match between the Montclair Sopranos and the London Lions. WIM Carissa Yip, 2014 Wachusett CC champion, is also a member of the Montclair Sopranos team. The Chess Chat episode can also be seen on video On Demand at http://www.fatv.org. Players must be present by 7 p.m. in order to be paired for Round 1. This week the board 1 pairing consisted of NM Brett Kildahl vs. CM Roger Cappallo & both players decided to explain their moves & ideas in respective YouTube videos, so the Wachusett Chess Club is treated with duelling videos for this interesting & important game. It was interesting to hear that you wanted to avoid the Benko and Benoni. I was hoping for one of those openings, and didn't have much of an idea what I'd do against the Slav, so you had me pegged in that regard. 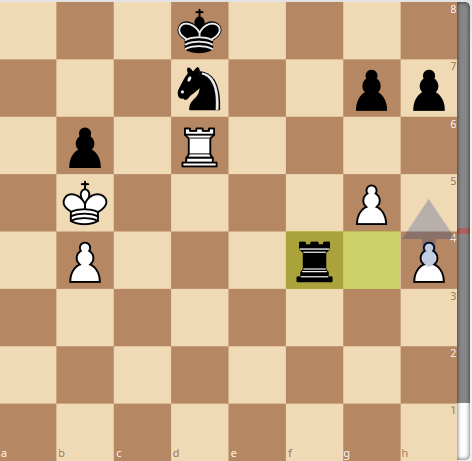 Your description of my late middlegame blunder as a slight glitch was generous. If you had had even a few minutes more on your clock at that point, I think you would have found that line and won the game. Thanks for linking to my video. I'll do the same! The last round fight for 1st place in the Reggie Boone Memorial, where I played Black in a Slav Defense against Brett Kildahl (2132). Brett's video on this game can be found at https://www.youtube.com/watch?v=DiYvEPejnBU, and the club's web site is located at http://www.wachusettchess.org. Brett also has made a video, which I've linked to in my description. As always, thanks for watching. NM Brett Kildahl is back at the WCC & started off the new year with a bang by finishing clear first at 5.0/5 in the five round Reggie Boone Memorial tournament, a full point ahead of his nearest competitor, second place finisher, Paul Godin. Lest one think Brett's clean sweep was some kind of lucky fluke, it's worth noting that after defeating a pair of strong class B players, Dave Thomas & Dave Couture, Brett then went on a complete romp by beating the three highest rated players in the club (aside from himself), Paul Godin, Ray Paulson, & Roger Cappallo, to achieve a tournament performance rating (TPR) of 2421. It's difficult to imagine a more convincing victory, so kudos to Brett. Paul Godin took clear second place by scoring a solid 65 move win over USCF expert Ray Paulson after Ray had declined Paul's offer to split the point at move 52. Gary Brassard beat Jim Hankard to share the under 1800 prize with Mike Commisso who beat Dave Couture in a somewhat complex tactical melee which will undoubtedly provide more material for any updates to Dave's book Progressive Tactics. There were several other games of particular interest in the final round. The two "giant killers", Tom Fratturelli & Don Briggs met each other & Briggs was victorious, which landed him the top under 1600 prize. Raaga Pulya scored a huge upset against 1507 rated Mark Wheeler & this combined with her round 2 victory over Briggs netted her 146 rating points & launched her to a new all time high of 1284. Michael David, Randy McLaughlin and Emily Gawboy. ♙ Stephen Murray was withdrawn from the tournament. Pictures from this year's Reggie Boone Memorial tournament. ♝ Receiving half-point byes were George Mirijanian, Geoff LePoer, Mike Commisso, Dave Thomas and Brian Biglow. ♖ Not playing round 4 were Stephen Murray, Hugh McLaughlin, Raaga Pulya, Bryce McLaughlin and Dillon Motyka. ♟ Randy McLaughlin had already withdrawn from the tournament. REMINDER: Players must be present in Room C159 by by 7:10 P.M. in order to be paired for Round 5 on January 30th. My weekly bout at the Wachusett Chess Club, this week playing Black against Geoff LePoer (1907) in a Torre Attack. I hope you find something of interest in it. Your opponent's flag is about to fall in a US Chess sudden death time control. The TD comes over to the contest to observe. They see that your opponent has run out of time-their flag is down, but the TD says nothing and does nothing. You look up at them with a quizzical expression, and still there is no response from the TD. To get the TD to act, you must point out the flag fall and say something-like "Flag" or "Flag Fall" or "Time." You and your opponent are locked in a position where your king gets checked over, and over, and over. The TD is watching this little dance contest; yet, says nothing. Why? There was no claim by a player. Note: the TD can declare a draw without a claim if the same position appears five times in a row. Your opponent touches their queen but moves their knight instead. They do this right in front of the TD; yet, the TD does nothing?! But if you make a claim, what do you think the TD will do? Rarely will a TD intervene in your game without an invitation by you or your opponent to do so. TDs rarely rule on a claim that you don't make, even if they observe a violation of US Chess rules (FIDE rules are a bit different and there are some rare exceptions in US Chess.) So if you want to claim a flag fall, draw, illegal move, touched piece, etc., then you have to make that request-verbally. One notable time a claim does not need to be verbalized is when 75 moves have been made with no pawn move plus no piece has been captured-then the TD can simply declare the game drawn. If a TD sees an illegal move early in the game-the US Chess rules have some wiggle room here-a TD may, unannounced, step in and correct the miscue (even though US Chess advises against it). They positively cannot do a thing about an illegal move in the last five minutes of a time control unless you or your opponent makes an illegal move claim-aloud. Coaches, friends, relatives, spectators, teachers, and all others cannot make any claim in the game you are playing. Having someone summon a TD for you is not the same as making a claim. When the TD does show up, you have to state your claim yourself. ♝ Receiving half-point byes were Ritvik Pulya, Dave Thomas and Larry O'Rourke. ♖ Not playing round 3 was Stephen Murray. ♙ Randy McLaughlin had already withdrawn from the tournament. ♗ Requesting half-point byes for Round 4 are LePoer and Biglow. ♝ Not being paired are Ritvik and Raaga Pulya as well as Hugh and Bryce McLaughlin. ♙ The Wachusett Chess Club welcomes new player Dillon Motyka of Leominster, who is playing in his first USCF-rated tournament. REMINDER: Players must be present in Room C159 by by 7:10 P.M. in order to be paired for Round 4 on January 23rd. For those of you who are interested, I'm back to making chess videos. The rest can be found through my channel (Brett Kildahl). In it I play Ken Gurge (1784) on the white side of a Caro-Kann Panov Attack. I hope you enjoy it. ♝ Receiving half-point byes were Arthur Barlas, Stephen Murray and Michael David. ♙ Withdrawing from the tournament were Randy McLaughlin and Francis Scanlon. REMINDER: Players must be present in Room C159 by by 7:10 P.M. in order to be paired for Round 3 on January 16th. Carissa Yip is on the Montclair Sopranos along with GM's Sam Sevian, Aleksandr Lenderman, Gadir Guseinov & WGM Sabina Foisor. PRO Chess League season 3 starts Tuesday January 8, 2019. Greg Shahade, Pro Chess League Commissioner, explains the Pro Chess League objectives & comments about the coming season in a 2017 interview on YouTube. Five Wachusett Chess Club players competed in a few events this past weekend. Here are the rating updates from: The 2019 Westford January Blitz & the 7th Boston Chess Congress tournaments. no major upsets (♔ ♕), 1 upset draw (♖). ♝ Receiving half-point byes were George Mirijanian, Ritvik Pulya, Stephen Murray and Tom Fratturelli. ♖ Not playing round 1 were Bryce McLaughlin, Raaga Pulya and Francis Scanlon. ♗ Requesting a half-point bye for Round 2 is Murray. REMINDER: Players must be present in Room C159 by by 7:10 P.M. in order to be paired for Round 2 on January 9th. The following ratings are in effect for the Reggie Boone Memorial, which begins Wednesday, Jan. 2, in Room C159 of the McKay Complex at Fitchburg State University.